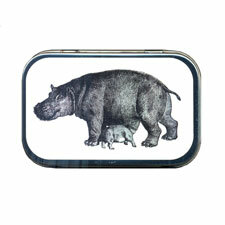 We've taken a vintage illustration of a mother and baby hippo and applied it to a new silver colored tin the size and shape of an Altoid mint tin. Use these tins to corral, sort, and organize small items such as craft and sewing supplies, hardware, loose change, family photos, first aid supplies, makeup and other personal items, or a notepad and pencil. You can also use them for gift boxes - just tuck in any small item or even a gift card. These are great for stocking stuffers, wedding or baby shower favors, or thoughtful gifts for coworkers - just fill with candy and watch their delight as they open the tin!